Today’s fast-paced world is constantly shifting the ways people use media. Make an impact in a visual culture by becoming a digital storyteller and follow an exciting career that prepare you to combine technical skills and artistic creation. Gain a broad understanding of the artistic, institutional, and commercial sides of the media industry. You’ll study audience analysis, production methods, management, and sales as well as understanding the key legal and ethical issues faced by all media professionals. Learn how to tell compelling digital stories in an ever-growing digital world. This major is recommended for students who want to pursue graduate studies and/or careers in broadcasting, filmmaking, social media, journalism, public relations, graphic design, advertising, and media management. Heidelberg’s Media Communication Center offers all students the opportunity to develop skills in producing, writing, and public speaking by working with our radio and TV stations. You can appear on-air as a broadcaster, news anchor, or radio DJ. You can also work behind the scenes as a producer, writer, or cameraman. Heidelberg integrated media majors have an outstanding record of success with a 100% placement rate within six months of graduation last year. This included both employment and graduate school. At Heidelberg, Todd worked at the student run television station WHEI-TV. He served as producer, reporter, anchor, executive producer and station manager. These experiences would greatly help him throughout his career. Early in his career he spent time interning at WDTN-TV in Dayton, Ohio. 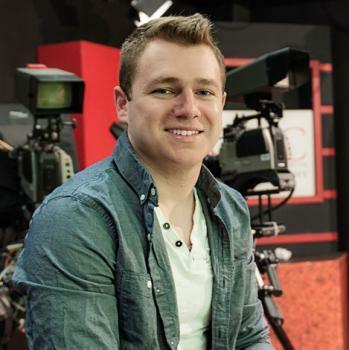 He also lived in New York City and served as an assistant to a variety of projects at ABC's Good Morning America before working for the NBC affiliate in Clarksburg, West Virginia, WBOY-TV. He worked as a producer, reporter and morning anchor. Now an Emmy award winning journalist, Todd works for WPSD Local 6 in Paducah Kentucky. He started out as a weekend anchor, but now serves as main co-anchor of the 5, 6 and 10p.m. newscasts Monday through Friday. Below is a sampling of courses offered in integrated media. For more information, see the major requirements. Scott Carpenter accepted the position of sports anchor at WLTZ-TV in Columbus, Georgia. Scott will be seen Monday through Saturday nights on the NBC affiliate at 6, 10 and 11 p.m. doing what he loves most: talking sports.